So many of the special-finish rivolis have beautiful reverse sides that it’s a crime if they’re covered with beadwork, but this lariat is the perfect way to show off beautiful double-sided rivolis. There will be two kits available – the Crystal Sahara version is both autumnal and warm, whilst the Bermuda Blue lariat is deep and magical. Wear it long in elegant style around your neck, draped around your waist or Bohemian style – many times around your wrist. 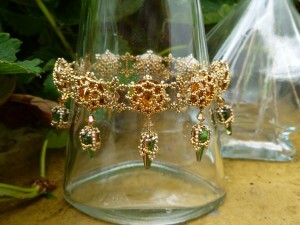 A gorgeous, dangly bracelet full of filigree, fancy and freedom! (How many alliterations can you get into a description of a bracelet?). Why filigree? 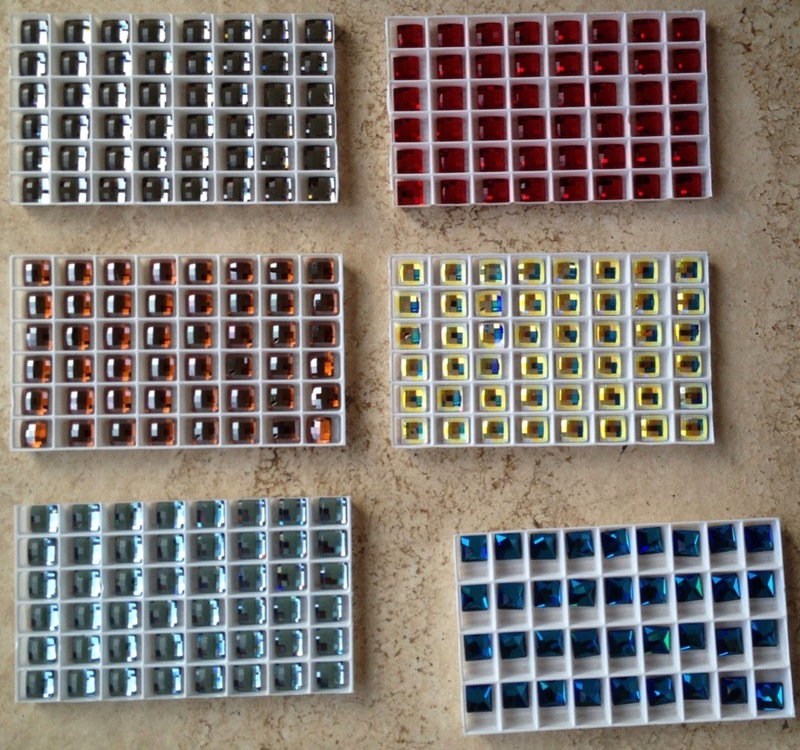 Well the connectors between the rivoli units are made with size 15 Czech Charlottes and look like tiny triplets of leaves, with an adorable little crystal guarding them. Why fancy? Because it is! And freedom, because the beading is a light touch – you can see the pretty edges of the rivolis and those adorable spikes haven’t been Peyote-ed to death! You can actually see much more than just the spike tips. I wear my Tatiana Bracelets a lot, and love the free movement and swing of the spikes against my hand. And finally…. one of the most fun things for me will be spending my birthday in New York – BEADING!!!!!! So come and join me! Beautiful bead work and Happy Birthday to you. I am a member of the Bead Society of New York. However I am a beginning beader. Would your upcoming June classes be too advanced for me? I hope someday to be a more expert beader (I hope in this life!!!!). I hope to be placed on your E-mail list. Hi Marcia, Thanks for leaving a comment! I think you’ll be fine at one of my classes – Tatiana Bracelet, the Tsarina Reversible Lariat and Lorenzo (which I’m teaching for your Society), will all be within your reach. My instructions will take you through step by step and I’ll be there to help. If you want to get a little head start on Lorenzo, have a go at circular peyote using Delica beads, and try some flat Herringbone. I’ve done a video on YouTube on how to do Herringbone and it’s important to be comfortable with the Herringbone turn, which I show you. I do hope to see you in New York – come along and give it a go! I think your work is just beautiful…….I do some stringing, but I would love to learn your work. When are you in NY and how much is the workshop. I would really appreciate your response. I will be teaching in New York on the 12, 13 and 14th June. I’m teaching at York Beads (12th and 13th) and for the Bead Society of Greater New York on the 14th. Look in my Dates and Events page for information on how to get in touch with them and workshop details. It would be great to see you there.